Well, I was made redundant some 18 months ago now and I spent my first year looking after my mum until she passed away in 2016. 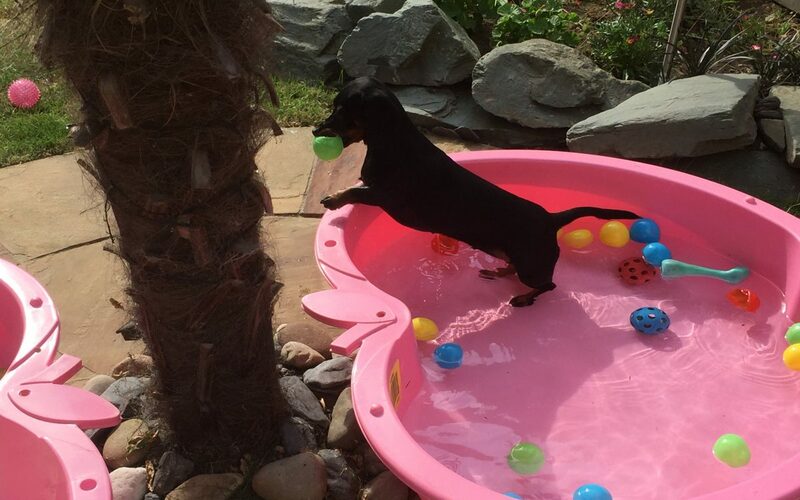 I have always since a very young girl loved Dachshunds for their character and loving nature. I achieved my dream of owning my first one, Daisy in 2014 and I decided she wanted to company and got Millie in 2015. They are half-sister’s. 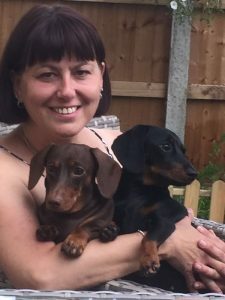 Me and my husband Colin, were looking for our first holiday for a while this year and I had enormous trouble finding a home to home boarding facility. Eventually a friend of friends helped out in the end which was a god send. 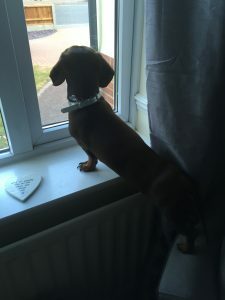 Whilst away I hit on the idea of having my own Home to Home Dachshund holidays, and investigated everything that I would need. Low and behold here I am the proud owner of The Daisy Hotel for Dachshunds. 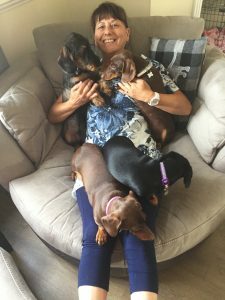 I am fully insured up to £1m for public liability and fully licensed with Basildon Council to reside up to 5 dachshunds excluding the residents. I am also a hobby breeder and Daisy had puppies earlier in April 2016. Yes, I am obsessed with these doggies and love them all dearly, and my husband of course. 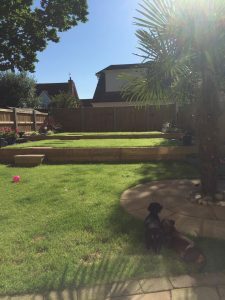 An exclusive 5 Star Hotel for Dachshunds, based in the Billericay & Noak Bridge area of Essex. 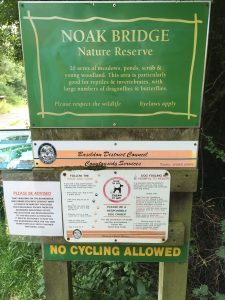 Surrounded by Barleylands countryside and The Noak Bridge Nature Reserve this idyllic location is perfect for your Fur baby to come on their holiday or breaks while you have yours. Our home is your Dachshunds home for the time they are here. 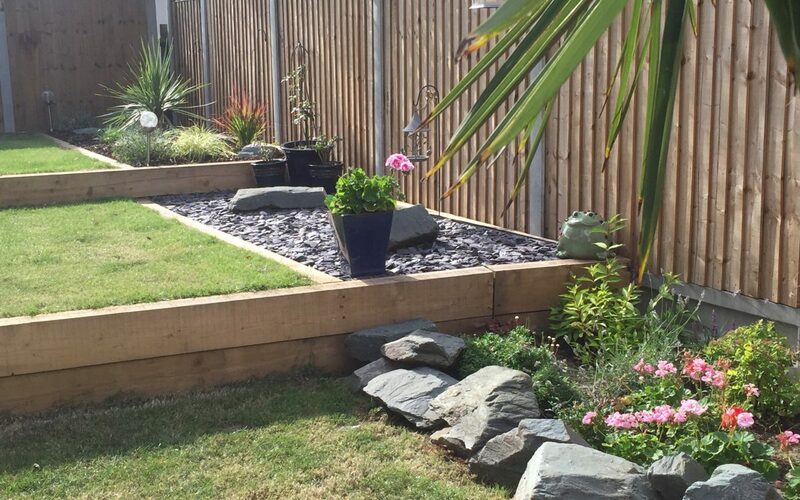 They have the run of the house and the garden, which is plant safe and totally secure. 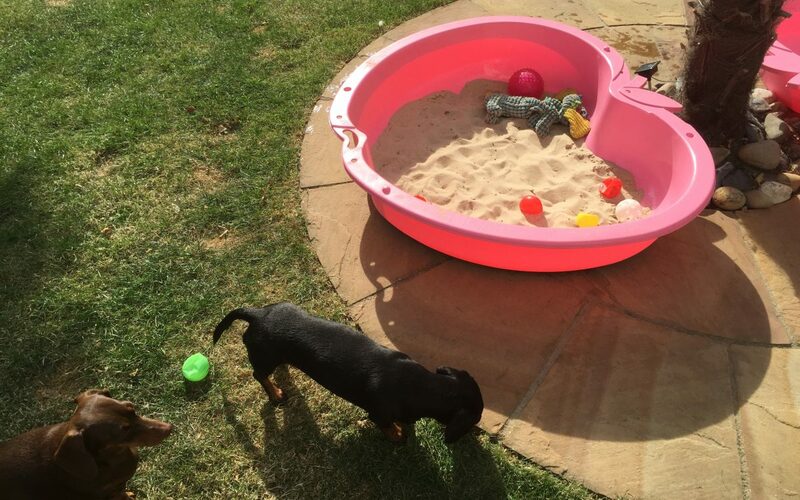 They even have the use of a paddling pool and plenty of toys for your doggie to play with. They will have walks and treats the same as you would do, and not breaking anything in their daily routine. 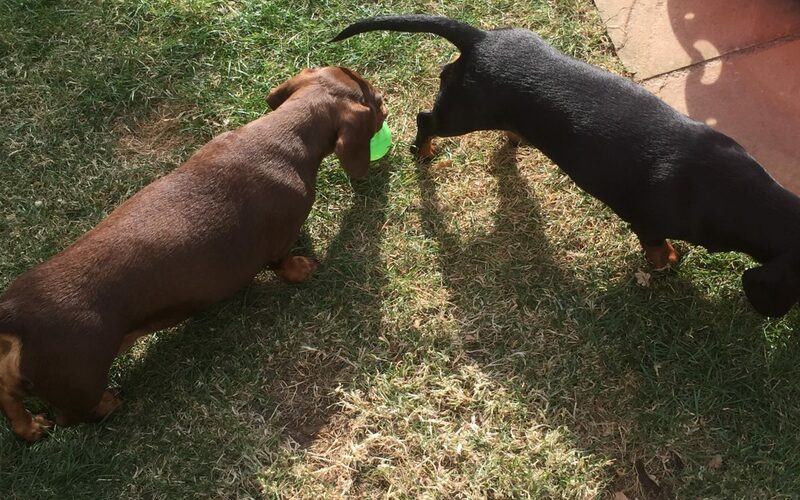 There are two Dachshund Hotel residents, Daisy and Millie to play with and everyone keeps each other company. The same breed are ideal playmates! 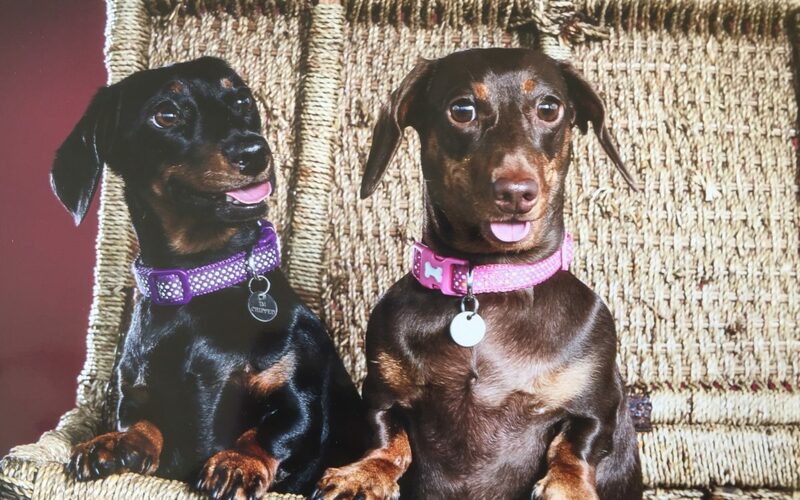 If your Dachshund is the brother or sister of another small breed, don’t worry we will take them for their holiday, they would not have to be separated. If you are pushed for time in getting ready for your holiday, I can offer a pick up and drop off service as I have a safety regulated dog car seat in my car. 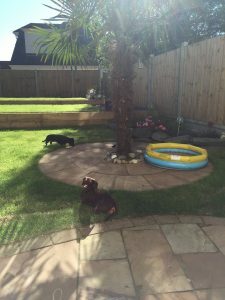 Apart from the Hotel I also provide other services to help working parents of Dachshunds. Daytime/ Lunchtime Welfare Check – If you work full time and don’t like leaving your baby for so long, I can check and walk them at lunchtimes between 12:00 and 2:00 just like you would. 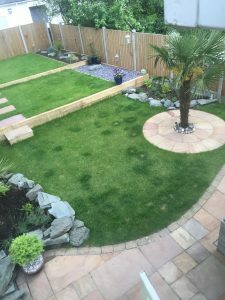 Pet Sitting – This is dependent on location and how many days. Price would be on application enquiry. 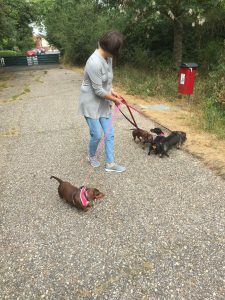 Dog Walking – Anytime dog walking and stretching those 3 inch legs. Is served as per the times you instruct or at the same time as the residents and if allowed, they can have scrambled eggs and chicken the same as the residents setting them up for the day ahead. Traditionally dinner is served after the owners (me and Colin) and again if allowed, your fur baby can have vegetables and chicken added to their normal food, but they won’t be left out. Should your fur baby be unwell with an upset tummy because he/she misses you, I have unlimited amounts of chicken, white fish and rice to help them maintain their food intake and get on the road to recovery. Doesn’t always happen but at least you have peace of mind. In the Hotel I have full local medical equipment and treatments for minor ailments, and I have the support of the residents Vets Practice in Stock Road, Billericay in case of any emergency. You will receive daily updates on your family member, via text or Facebook and includes pictures and videos. Your peace of mind is key to you enjoying your holiday and you can see they are enjoying themselves too. 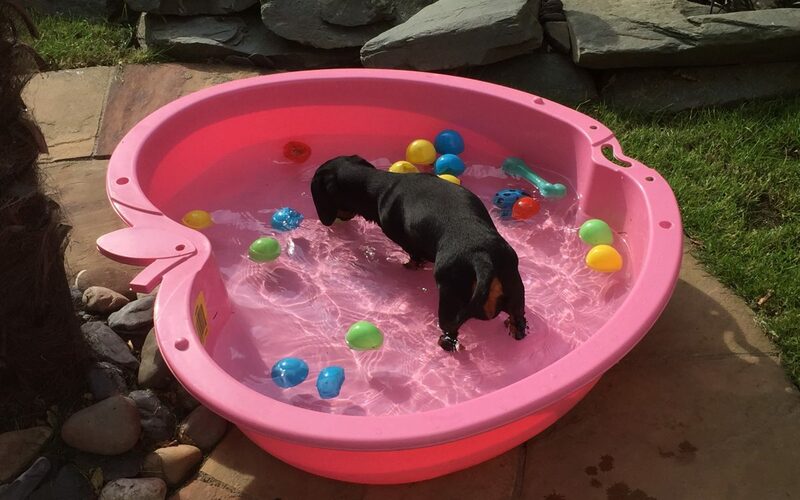 What to pack for your Dachshund’s Holiday? To make your fur baby’s holiday is as stress free as possible, I like to have their own things around them, so here’s what they bring with them. Favourite Toys, bring them by all means, the residents and guests are likely to pinch each other’s though! Medicines (so that continuation is not interrupted), but I also request that all worming and flea treatments are up to date, or not administered nearest to your holidays so that everyone is safe. 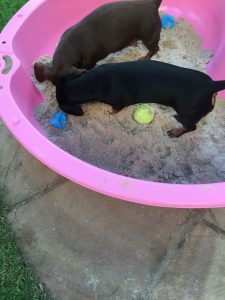 The Daisy Hotel for Dachshund Guests will be required to fill in a registration form (with your mummy and daddy’s help), which will provide all their information, your contact details, do and don’ts and any special instructions for their stay. For example, walking on/off lead. 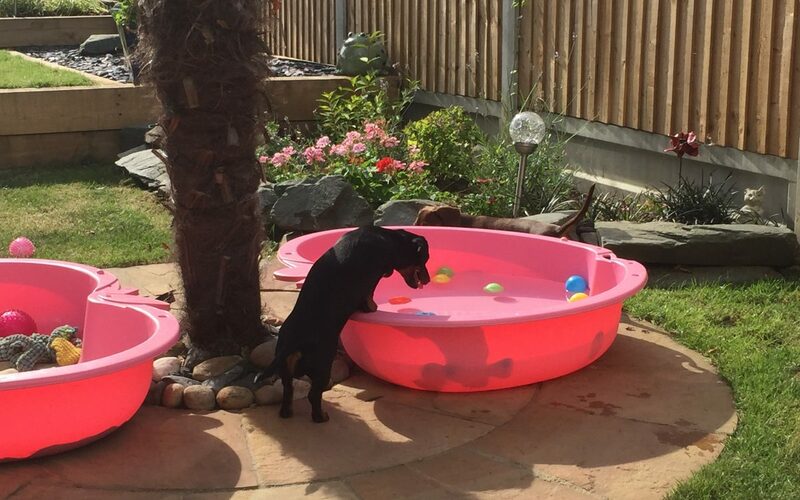 So when you are planning your holiday or break away from home come and see us to book your Fur Baby(s) into The Daisy Hotel for Dachshunds and you know they will be treated as one of our family, where they are safe, pampered and loved while you are away.